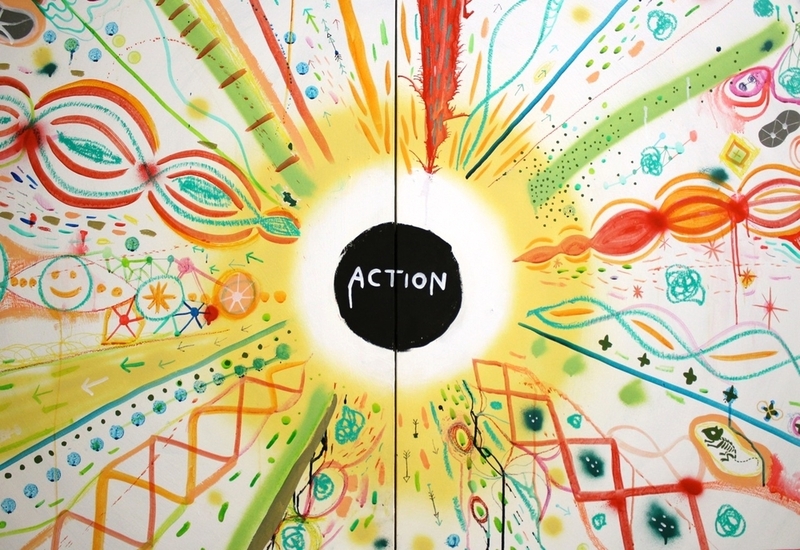 ACTION Studios was founded by Monica Choy and Souther Salazar in 2013 and provides workspace for 7 artists working in many mediums including painting, drawing, illustration, animation, fiber arts, experimental media, and publishing. It also houses the headquarters for Stay Wild Magazine and ACTION Tapes. We had the opportunity to lease a 1650sf space in the North Coast Seed Building in NE Portland and we filled it with forts, climbing walls, community area, mini-theater, and plenty of room to make art. The space has acted as a creative incubator to launch Stay Wild Adventure Magazine and Radiant Human Aura Photography. In an age where most of the things around us and in our everyday use are made by machines in factories in far away places, it feels very rewarding to learn some old ways that used to be common knowledge. Our relationship with plants and nature has changed so much over just a couple generations and I struggle with teaching myself how to care for plants, to learn about plant-based nutrition, and herbal alternatives to Western medicine. Things that seemed like second nature to my grandmother. One of the many joys in learning more about plants is experimenting with dyeing fabric with plant matter. I was able to really delve into some deep practice and research during my art residency at Summit in Eden, UT. Read more about it here. Along with some bundle-dyeing and traditional dye pots, I also played with hapazome method, a way of transferring pigment from fresh plant matter onto paper or fabric by literally pounding it out with a blunt object. The Trading Tortoise project is part performance, part social experiment and focuses on special objects and the stories and emotions they hold. In 2012, the project traveled the US and Canada for 6 months, making stops in 33 cities. At each stop, folks would bring an object that had a story behind it. It could be anything. People brought us things that were handmade, silly, from breakups, natural oddities, sentimental, fine art, kid's crafts, ephemera, one-of-a-kind treasures, or even family heirlooms. They would sit at the opening of our tent and tell us about their object. Based on what they shared with us, we would offer 3 or 4 different objects we were carrying with us and tell them the stories behind each one. They could then choose to trade for one of our objects or to leave with their own. We began with 100 of our own things and stories but eventually ended up trading people's objects to each other around the country. Many of our participants reached out to each other and made connections through the trades.